Use four of the supplied M5 x 4.5 mm flathead Phillips screws to secure each of the hardmount brackets to the sides of the server. 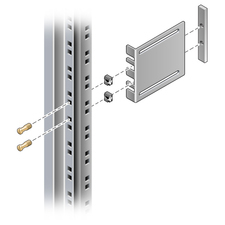 These hardmount brackets and screws are shipped with the standard server ship kit, not as part of the sliding rail 19-inch, 4-post rackmount kit. Press in the button on each slide assembly and pull the glide completely out of the slide. Using eight of the M4 x 0.5 x 5 mm panhead Phillips screws from the rackmount kit (four for each side), screw each glide to the side of the server chassis. Lift each short bracket to the desired position at the front of the rack and attach a short bracket to each of the front rack uprights. Use two of the brass M6 collar screws and M6 cage nuts (if required), and one threaded strip, to secure each bracket. Lift each long bracket to the desired position at the rear of the rack and attach a long bracket to each of the rear rack uprights. To secure each bracket, use two of the brass M6 collar screws and M6 cage nuts (if required) and one threaded strip, exactly as you did for the front rack uprights in the previous step. Extend a slide to line up the access holes with the front screw holes. Secure the slide onto the short and long brackets at the front and rear of the rack. Use the M5 panhead screws from the inside. Use the M5 nuts, plain washers, and star washers from the outside. 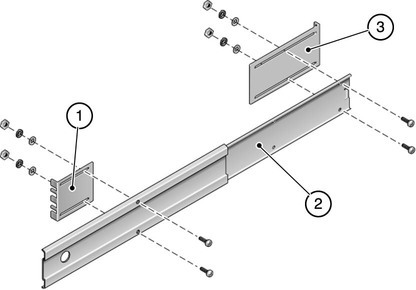 Use extension brackets instead of the long brackets if the dimension is greater than 665 mm. Mount the slide on the other side of the rack. Repeat Step 7 and Step 8. 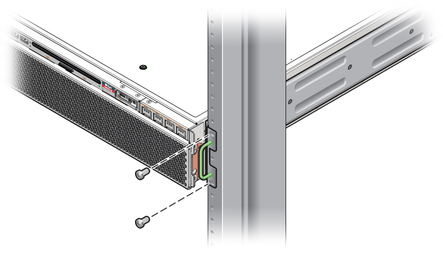 Push the slides completely into the assembly on each side of the rack and release the stop catches. 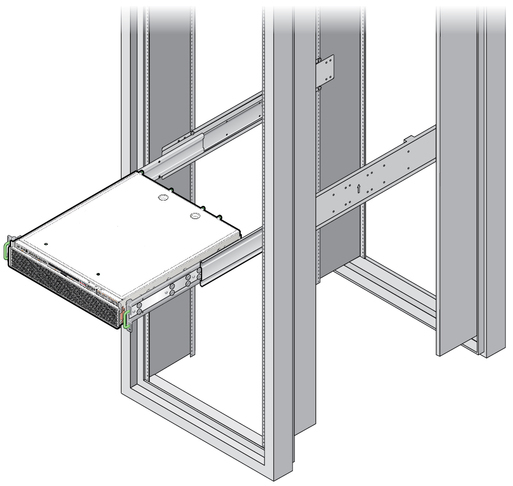 You might find that there is too much or too little room between the two slides mounted in the rack. 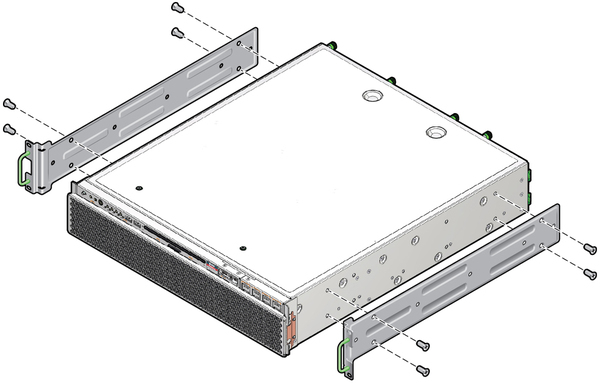 Consequently, the glides attached to the server might not align correctly with the slides in the rack. 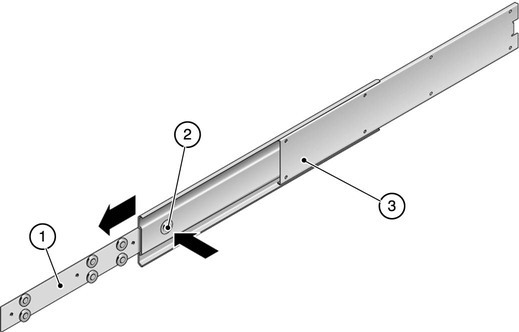 If either situation occurs, loosen the M6 collar screws and cage nuts on the long and short brackets (Step 5 and Step 6), move the brackets inward or outward to the appropriate points, then tighten the screws and cage nuts again. 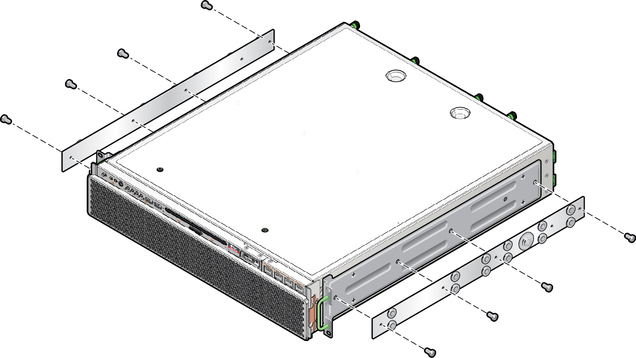 Using two screws per side, secure the front of the hardmount brackets that are attached to the sides of the server to the front of the rack. The size of the screws varies, depending on your particular rack.